In order to develop sustainable tourism associated with preserving the heritage of Ha Long Bay, Quang Ninh has affirmed that it is not developing at all costs and minimizing the consequences of visitor overcrowd at some sites on the bay. Over the past time, the number of tourists to Ha Long Bay increased sharply each year. In 2016, Ha Long Bay welcomed 3.14 million visitors, up 22% compared with 2015; 2017 welcomed 3.92 million visitors, up 24.7%. From the beginning of the year, on peak days of the tourist boats have served nearly 29,000 visitors. According to Nguyen Huyen Anh, deputy head of Ha Long Bay Management Board, tourism development alongside the positive side also creates pressures for preserving the heritage. Too many visitors to some places such as Thien Cung, Dau Go, Sung Sot, Ti Top caves has exceeded the capacity of the attractions, thus affecting the resources. Overcrowding leads to the fact that some caves in the bay are losing their natural beauty; Living habits of some species on the bay also change, even the risk of decline in the number. According to Nguyen Huyen Anh, Ha Long Bay is facing many problems of growth and negative impacts on the environment due to the number of local customers at some points. In this context, sustainable development is seen as a strategic principle and a key to securing long-term benefits. Therefore, the Committee will strengthen measures to protect the ecological environment and tourism environment; To study the application of high technologies in environmental protection suitable to the practical situation. There are currently 505 cruise ships in Halong bay with capacity of 21,500 seats. It is worth mentioning that the number of ships has decreased 34 compared from the time Ha Long City People's Committee took the function of state management from the Department of Transport. However, due to increased capacity of the ships, the number of tourists to Halong kept increasing. Although all vessels have installed a water separator system, equipped with waste collection systems but can not avoid causing environmental pollution during operation. Therefore, in order to develop the sustainable tourism of Ha Long Bay, it is necessary to raise awareness and culture of behavior for ship owners, captains and crewmen. Resolutely stop all cruise ships that fail to meet the requirements of safety and environment; deployment of comment boxes in the port area, set up a common telephone hotline for all units, functional forces. New tourism products have been created to improve the quality, to exploit in depth, distribute and reduce the pressure on other points of visit, especially in the core zone of heritage. 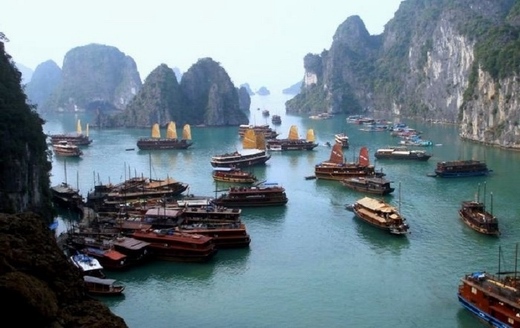 Pham Dinh Huynh, Standing Deputy Head of Ha Long Bay Management Board, said: "We have reported to the provincial People's Committee plans to open three more routes to visit Ha Long Bay is routes 6, 7 and 8. In fact these routes are separated from Route 4 that goes to Hang Co, Thay, and Cong Do grottoes. Cap La, Vong Vieng, Hon Xep park. For a number of scenic spots, offshore will prioritize international class services to provide visitors with better quality experiences. There are currently two companies applying for a high-quality service. In the coming time, Halong Bay will give priority to branded travel agencies. Another measure to reduce the load is to accelerate the investment progress, upgrade the infrastructure of the points of potential to serve visitors, reduce the load for the traditional points, but not break the original landscape of heritage. Currently, 89% of the entrance fees to Ha Long Bay have been alloted to the Ha Long City People's Committee to implement Ha Long Bay development goals, including restoration, renovation and ODA related to the environmental protection. With funding left Ha Long City has invested in the management and preservation of heritage, develop more auxiliary products, improve the environment.